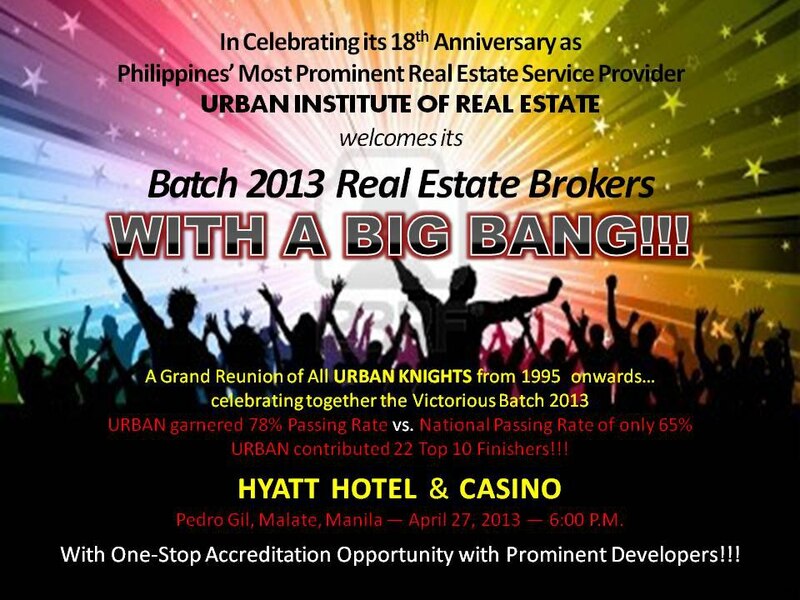 The celebration party on April 27, will also serve as a sort of reunion of all URBAN CRES Batches from 1995 and thus will serve as an opportunity for the new brokers to touch base with the experienced brokers. At the same time, several big developers will present their companies and projects and invite and accredit new brokers in CRES Batch 2013. Don’t miss this momentous event. Spouses, Relatives, Friends are welcome to join us. Damage is P800.00 only for the first 200 members to make deposit and P1,000.00 for each companion BUT not later than April 19, 2013. BPI Acct No 9849 0268 17 (NOT BPI Family Savings), account name of Maria Cristina Gallegos. 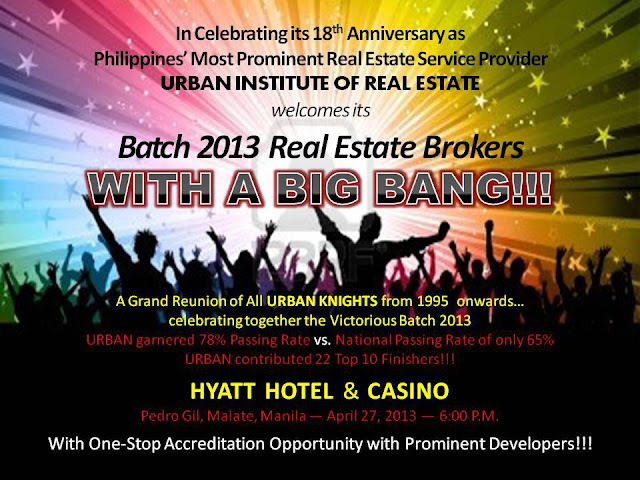 Then scan and email deposit slip to info@urban-institute.com indicating names of attendees, cellphone number, and stating that deposit is for celebration party on April 27. Last day to deposit WITH DISCOUNT is April 19. You will receive confirmation of receipt of your email within the next day, but please post also in our FB page that you have made such deposit. In case of non-attendance, deposit made shall not be refundable. But may be assigned to others.